Finally! The sunshine is out and we can wear our cut-off shorts (...some of the time), and while we don't need an excuse, we finally have one to go to outdoor shows, have cookouts and bike all around Brooklyn to attend them this weekend! Not only are there reasons to go out during the day but there are night time events, with food and music, and culture! Read below to learn about the rad events at Brooklyn Museum, the Ethiopian-Nepali fustion dance party, and some very illusive outdoor bashes this weekend! The weekend truly starts this Thursday at Shea Stadium with Austin band The Shivery Shakes with their light-hearted, surfy tunes. Local bands involve The Big Huge who's upbeat, rock and roll will get everyone in the mood for an awesome weekend. To throw you back not only to awesome springtime celebrations but also to high school, come see these bands in a basement this Sunday! The ultimate Memorial Day weekend fun clearly involves basement shows. Enjoy the glitch-y melodies of Adam Jungerheld, and the lo-fi vibes of Oh Golly. This Friday, Brooklyn TransCore has put together a really fantastic event featuring Penguin, Girlcrush, Tesla's Revenge, Bitchtits, and Heavy Negatives. Not only is there great music to start off the fantastic weekend but there will also be Tarot readings, and raffles involving prizes from Lush Cosmetics, Sephora, Please, and more! 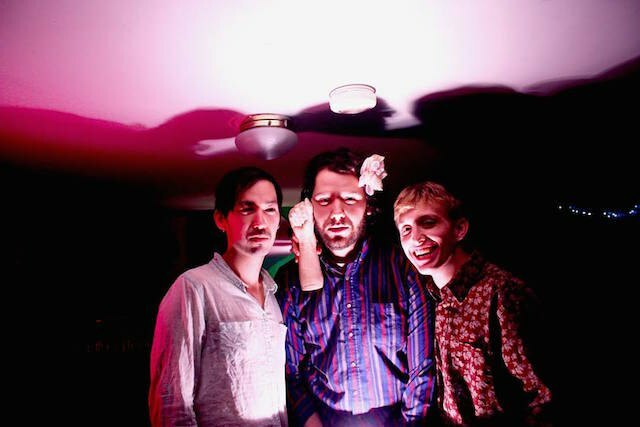 Get down Saturday night with spacey, psychedelic groups such as The Yin Yangs and Lodro. It will be a pretty loud and raucous evening to break out your pre-summer garb and bang your head about at Palisades as your Memorial Day weekend is in full swing. Brooklyn Night Bazaar has been a great way to celebrate a holiday. Enjoy fun handmade/vintage garb and eat artisanal pretzels, then walk along the water when the music is done before they move to Jacob Riis Park soon. Take a break from the browsing and stuffing your face to check out Toronto band Greys, as well as all the fun Brooklyn bands that will be performing! You may consider not even wanting to add this to your plans because of the $20 staring you in the face, but $10 of that cover goes straight to rebuilding The Butterfly Home, which was destroyed twice in the most recent earthquakes. The other $10 goes towards your own entertainment involving an amazing collaboration of Ethiopian Masinko Player Setegn Atanaw and Nepali drummer Raj Kapoor. Not only will you dance your Friday night of your 3-day weekend away, but you will be donating to a really good cause. This is going to be a fantastic way to spend your Thursday, and while it's not quite Memorial Day oriented, it is really really cool. This is an evening to celebrate and learn about Jean-Michel Basquiat through insights into his creations, poetry readings, music by King Holiday and more! This Sunday at Trans Pecos, Grab your hats and sunglasses, even though it will be night time, for some avant garde jams brought to you by Dumb Wolves, and the blistering lo-fi melodies of Turnip King. Green Pages will blind you with jangly, garage rock, and Pony Farm, who just launched a kickstarter campaign, plays sweet, strange witch-inspired tunes with haunting harmonies. Get Some memories there! Mystery may be the best way to get someone to go to your event as evidenced by this video which reveals only what seems to be somewhere in Bed Stuy, tents, shwag, and a lot of dancing. Chances are this will be the most authentic Memorial Day Celebration since it is in fact on Memorial Day, and there is possibly food involved. But who knows? It's a Mystery. Presale ticket info here! 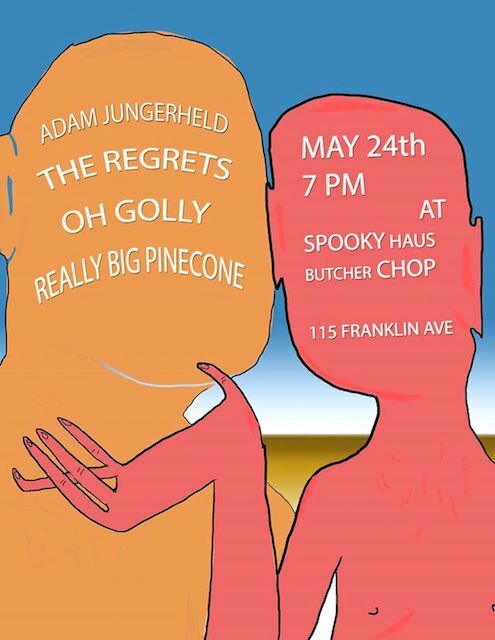 This show features not only two stellar touring bands in Spoonboy (DC) and The Goodbye Party (Philly) but the local bands are all pretty rockin. Shark Shark , who is made up of members of Nana Grizol, presents some folk-punk with horns ditties. Bellows bundles so much energy and emotion into their sound and blasts it forward in their live performances in the most humble and exhilarating ways. Emilyn Brodsky's straight forward vocals and catchy melodies will keep you head bopping for days. Overall, you will not hate yourself for spending your Memorial Day's eve eve here, and while it's not day time, and there is not really any food, the music will keep you full of energy and happiness. Enjoy your weekend!